I just wanted to buy a lawn mower…. Budget – something to fit within the specified budget. Intended purpose/requirement – something that addresses requirement. Value add – features and benefits which would justify an increase in my allotted budget. Considering it was a lawn mower, aesthetics, usability and its desirability – hey, it IS a lawnmower – play slightly lower in the requirements. Translating this to the complex world of mowing my back yard, I also didn’t want to be on a one way street of having to shell out lots of money for ongoing repairs and maintenance – I would happily pay extra for reliability, sturdy construction and execution of intended function. My starting budget was $500 – as good a place as any to start – with which I would use as a yard stick to rate and judge the good/bad of the machines. So what were the good and bad with the websites I encountered? Home page – nice. It is reasonably well laid out, and broken down clearly by activity/location areas into Home, Golf Course, Contractor, Stadium and Agriculture. Pretty simplistic and a nice start. Selecting “Home”, and then in turn selecting, “Walk Power Mowers”, the page was really, really long. It waxed lyrical about the features and benefits, having little photos next to each, to reinforce that position. The photos were bordering on too small, almost pointless. The list of models was distinguished by way of Military style call sign model designations and limited to the blade diameter and the engine model type. No Prices. No pictures of product, no descriptions on why you would go for one model verses the other…. Worst of all, and this is bad considering I have a 24″ widescreen at work, the font was rendered in tiny 6 point . The dealer locator required a postcode and/or town – worked well, although again the screen real estate could have been utilised in a better fashion. Thumbs up to the persistent primary navigation along the top of the site all the time. 6/10 for overall design and intended function but bumps downwards for that ridiculous font size and poorly executed sub sections. 4/10. Even before going to this site, I knew it was going to be expensive as the Green & Gold livery of the John Deere gear is considered the pinnacle of agricultural equipment as I am reliably informed by my farm running in laws. Similarly set up to the Toro site, it breaks down equipment by activity on the home page by way of smallish images buried within a poorly executed flash navigation supported by a very hard to read vertical labeling. A nice touch was the presentation of a Products and Equipment section allowing step by step navigation to the allotted equipment areas. Content structure in the actual product pages is inconsistent, some models have an image, some have their specs detailed in bullet points (with ambiguous headings) and some of them opt for tabulated data. No prices. Printer friendly button, is initially useful for older browsers although superfluous in light of a well designed page in the first place. Overall, penalised heavily for the inconsistent information presentation across grouped products. Also, not so cool is the lack of a com.au domain – it is a sub domain on the global site, making it difficult to market for in the region from a memorable URL point of view. 5/10. This Japanese manufacturing giant’s home page is the direction for a network navigation, directing you to Automotive, Marine, Motorbike, Personal Watercraft & Power Equipment. Visually, light years ahead in terms of aesthetic design, a real credit to the design agency and the strong brand which Honda has worldwide, but dig a bit further from a navigation point of view and the site becomes extraordinarily frustrating. You can find Lawn mowers easily enough, but you have to go through each model one by one and to get back to the overview, you have to hit the browser back button – there isn’t a breadcrumb in sight! Introduction, features & specifications are all uniformly well laid out and image quality is good. The only gripe, aside from the missing breadcrumb, is the dealer locator, which works fine but launches into a totally differently branded site, which is appeasing to the network navigation demons – a jar on the user experience. Again, you are forced to hit the back button to return back to the site. 8/10. Big site. Lots of lawn mowers. Too many, in fact with little to distinguish them until you get into the detail. The landing page has good images of the product, broken up into its product range, but there is no differentiation between the ranges aside from a technical spec overview, which to novice lawn mower hunter me, meant…. not much at all. Inoffensive design (just) is simple and easy to use. Navigation is persistent. Product pages are pretty good, if somewhat plain. Picture is okay size, information is consistent and informative. No price, leading to a lack of hierarchy amongst the machines. Dealer locator is a pain in the neck to use, forcing you to wade through a clumsy inelegant super long list and worse unless you click the relevant suburb, you can’t determine what sort of dealer it is ie. President Series Only, MSV Series Only or both etc. 6/10. Similar aesthetic and navigation standards to the Masport website – minimal. 2 main groups – Domestic & Professional, sorts out the inquiry direction. You get to the landing page and you are hit with 20+ different mowers and absolutely no way to determine hierarchy or features between any of them as they all look similar. Pictures are good. No prices. Dealer locator is by far and away the best. Select a state and bang, they are all shown up for you to browse through. 7/10. So, overall, not a great rap for the lawn mower world – all sites had failings, some of them fatal from a usability point of view, others poorly representative of the brand. I waded through and read for an hour or so and ended up going down to the local lawn mower shop and had a chat to the experts, and followed up with a few friends and colleagues who had already ventured down this path. 2 things jumped out at me in every conversation I had – Get an Alloy Deck & stick with either Honda or Briggs & Stratton engine. Nothing else. The ironic thing after all this toil and endeavour in which I was about to lay down the hard earned cash, is that we got given a lawn mower as a Christmas present. 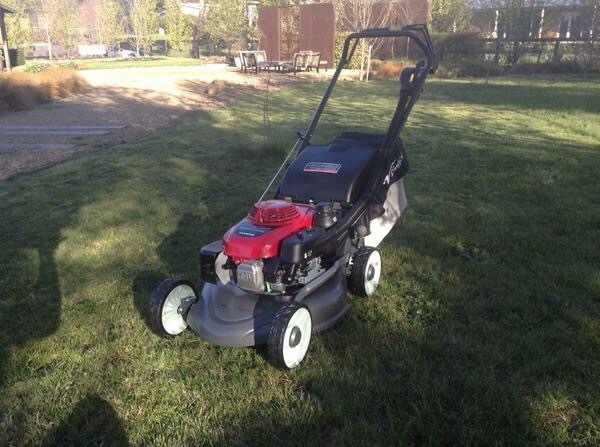 Got a Masport 19″ with a Briggs & Stratton 4 Stroke Engine which has been great. Update February 2014: with half an acre of Michael McCoy/Paul Bangey influenced gardens to now mow, I’ve upgraded the Masport, which served duty, but wore out, to a commercial grade Honda Buffalo Bull 196M Longreach. Fantastic.